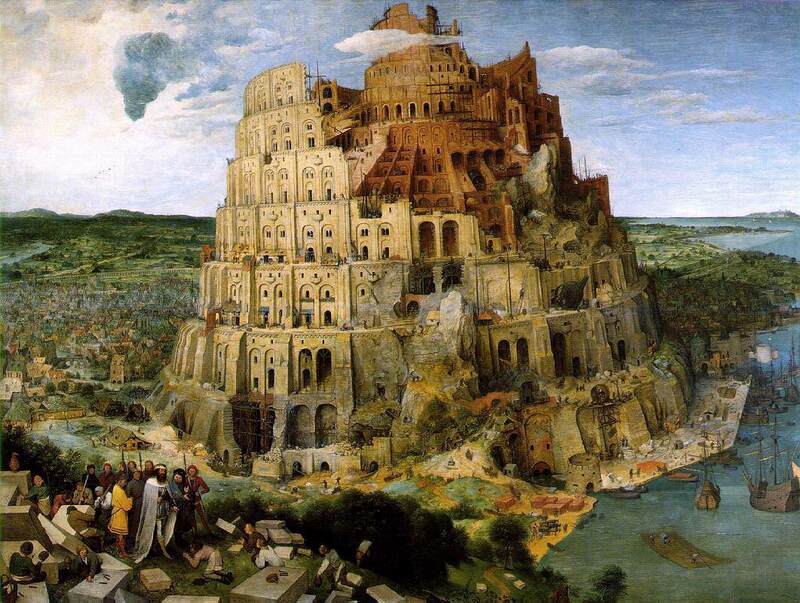 The picture to the left is Bruegel the Elder’s take on the Genesis 11 story of the Tower of Babel. In the scripture, we’re told that there was only one language and the people came together to build a city with a great tower that would reach to the heavens. In response, the LORD comes down to check it out and confuses their languages and scatters the people across the nations. I’m not a biblical scholar — I’m a sociologist. So my first inclination is to treat this story as a cosmological allegory of “why the people down the road don’t talk like us”. It’s the kind of story that fits within an oral tradition explaining to children why things are the way they are. But I did do some quick internet research and was pleased to find this entry from the Oxford Bible Studies Online. I was pleased for several reasons. First, the author is Brent Strawn from Candler Seminary at Emory and I’ve been friends with his father and brother for several years. Second, because the piece also used the Bruegel painting as illustration. And Third, because Brent’s analysis is directly applicable to the issue of religious group boundaries I’ve been exploring for several months. Brent suggests that there are two interpretations of why the tower was a problem. One option is that it has something to do with pride. Building a huge edifice would let everyone know that these were cool people who had things together. He goes on to say that this chapter stands in stark contrast to the calling of Abram; there it is God who does great things through people. The second option Brent explores is the role of fear. They needed the city to protect them from being scattered across the earth (as was God’s plan). The “hunkering down” as he calls it, is in resistance to the world as they found it. As I said, I’ve been reflecting on the ways in which evangelical groups build artifices to separate those on the inside from those on the outside (for samples, see here and here). And I’ve come to a useful image that helps explain the process. We tore down the Tower of Babel and then used the self same bricks to build enclaves of our own desiring. And we did it for the same two reasons the Tower was built in the first place: Pride and Fear. Pride comes in when we attract hordes of followers to show that we are right. Zack Hoag has consistently exposed the ways in which the evangelical church (both conservative and progressive) have been seduced by the culture of celebrity. I am not immune. I want page views, retweets, Facebook likes, and recognition. I want people to tell each other about my writing. I want to have access to publishing empires that turns a lecture series into a book and a set of DVDs. We build our enclaves because it allows us to sit inside our secure walls and lob critiques at those walled enclaves down the block. We hope that doing so will prove how smart we are, how right we are, how close to God we are. Especially if we can demonstrate that by comparison to those wrong-headed folks next door. Rachel Held Evans posted a great piece today discussing what it feels like to be on the receiving end of the critiques lobbed over the wall. It’s a story of hurt and misunderstanding, of false accusation and presumption. But it also contains some deep introspection to make sure that parallel assumptions don’t result about other groups. I’ve been reading Christena Cleveland’s Disunity in Christ. It’s a wonderful book (not surprisingly, it’s chock full of good social psychology!). I’m only partway through, but already the implications are powerful. We find comfort and identity through our groups within our walls. But that very comfort and identification contributes to our misreading and misunderstanding the other groups. Our pride causes us to overstate our own position and not really listen to others. If pride makes us overstate our correctness, fear calls us to demonize all opposition even if we can’t name them. We build our walls so high that we don’t know what’s out there. We just know it can’t be good because it’s not what we have in here. This post was prompted by one shared by Peter Enns over the weekend. It was about a conference announcement about a regional meeting of the Evangelical Theological Society. The brochure is titled “The Liberal Seepage into the Evangelical Culture” and shows a scary wolf in sheep’s clothing. I’ll let the word “seepage” go for now (sounds like a medical problem). But the very identification of “evangelical culture” as a thing is the very essence of wall-building. See, THEY are infiltrating into the space WE have created for ourselves. Even if our concerns about them are based on irrationality and exaggeration. In the words of Elmer Fudd, Be afwaid. Be vewy afwaid. Fear take us funny places. It makes it easy to do things or say things about brothers and sisters we would not otherwise do or say. Because somebody has to. Otherwise, how would we protect the walls from intruders? Don’t you know what the stakes are? Christians aren’t motivated by pride. Christians aren’t directed by fear. We are following in the way of the Christ who sacrificed his status and position to inaugurate a new way of living through death on the cross and launching of a Kingdom at hand. We have an assurance running throughout scripture that we are not alone but have the very God of the universe with us. What happens if we tear down our walls? I’m still working on this but I think we find that we are able to engage those around us. We find them reasonable people who ask interesting questions, who have fascinating life stories, who have real struggles. In short, we find them to be people created in the image of God. People who, if we take Matthew 25 seriously, are both representatives of Christ and perhaps unaware Kingdom-builders (“When did we do that?”). In short, trusting Christ and his Kingdom journey means that we don’t need walls and boundaries. Because God is already at work building the Kingdom. We’re just along for the ride to offer water when asked. I’m also reading Prodigal Christianity by David Fitch and Geoff Holsclaw. Their writing both resonates with my thinking and makes me feel like they’ve already said it better. The central thesis of their book is the God went into the Far Country (where we live) and we are called to do likewise. Going into the Far Country requires trust in God and deep courage. In that way it becomes a matter of testimony to the Greater Story of which we are all apart. As Mr. Reagan said to Mr. Gorbachev, Tear Down Those Walls! fwiw, my old OT Lecturer (William (Bill) Osborne) suggested to us that one of the issues with the tower was that it was made of Bricks – there was no natural resource (reliance on God), so they created their own resource, and tried to make their own way to heaven. In much the same way as the church in Laodicea didn’t rely on God for water, vision, and fine garments. So, while Fear and Pride might be issues, the real issue is the complete and utter abandonment of God, and trusting in Him for provision, and therefore ultimately salvation. For the Babelites it only ended up in disparate languages, but for Laodicea it ended up with destruction. Thanks for sharing. My take is that we built walls due to underdeveloped trust in God. Rather than join where He is, we focus on our own efforts and remind everybody how much we understand Him. This story, like the Creation account and The Flood before it, has fascinated me my whole life, when I took them literally, and now as allegories. I can hardly fault these people for not trusting God since he had recently wiped out most humanity and that had to be fresh on their mind. How would I feel in their shoes? Fearful to be sure. In this light then, I see less pride involved than the desire to leave some kind of legacy should the worst happen again. A memorial to existence. That’s not to say an element of pride didn’t exist, but that too is ‘in the image of God’ and hardly deserving the fate that befell people of Babel. In my more cynical moments, I see this story as exactly why we don’t believe in God. How does God expect the Truth to survive this diaspora? Wouldn’t the odds of the Truth remaining somewhat intact have been exponentially greater if the world only had one language (and perhaps one color) and migration was a natural progression of need and/or curiosity? How many great things might have been accomplished with a common language and collective, shareable knowledge? In essence, when God confused the tongues and scattered the inhabitants abroad, He also guaranteed the Truth would also be scattered and confused as well, exactly as we see it played out today in cultures around the world. Or it could just be a story about why people down the road or across the sea look and sound different than we do, and like in the Creation story, one that again makes God the catalyst. I’m fascinated by the fear/pride motives. This is good thinking material for me. My question is this: how do we have “safe” people in our lives (e.g. close friends, small groups), and not make those into exclusive enclaves? I think we need safe people close to us. Especially if you’re a verbal processor like me! But it’s important to take the risk of “banking” that friend’s support to have the necessary conversations that break down walls. I agree. It’s been very rewarding connecting with people who are trying to maintain connections to people who are both more and less progressive than they are. It’s a hard place to be, but a great place to learn. why would anyone take these stories as allegorical and not historical when the author(s) clearly wrote them as historical? As I wrote, I’m not a biblical scholar and so relied on some other sources. I’d be interested in the reference to the historicity of the story as intended by the authors. My purpose was to use it allegorically as it related to a larger sociological question I was posing. I appreciate the additional voice on combining reality and allegory, but I’d ask you to watch the low-level name calling on my site.